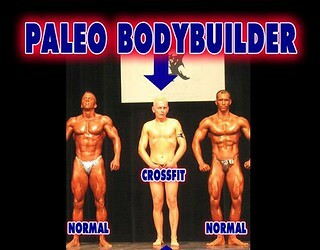 Paleo Bodybuilder (Pics!) - Result of the Paleo Caveman Diet on Bodybuilding & Muscle. The Paleo Diet says eat do like a Caveman. Cavemen lived in caves. So they were very pale. Sickly looking and eventual Albino-ism (pink). Cavemen didn't lift rocks to build anything, otherwise we'd see it today. So cavemen had to run around instead, not only hunting but running away quickly from carnivores and wild animals chasing them so cavemen had not a lot of muscle. So they were instead spindly, pale, and lean, good for running away from things that scared it. Paleolithic man that lived in the arctic was also very pale, living in icy regions. Ice Age man didn't get much sun or vitamins and was also pale. Arctic Cavemen, like the Inuit don't lay out on the beach, so paleos may look more sickly than a normal person, like the very pale Mark Sisson does. Another "Pale"-eo person example is Art De Vany. Arthur Devany is almost bleached. The paleolithic diet in icy areas would result in a fat obese physique. Because the body would gain fat to insulate from the cold. The paleo diet has evolved to make humans fat if you don't live in a tropical climate. The human body has evolved to build up loads of flab and gut flab eating paleo in order to protect from the ice age climate. So the Paleolithic Diet has evolved to make mankind either pale and skinny when it's warm, or pale and blubbery when its cold. The Paleo Diet does't taste too good. Cavemen picked at luke-warm bodies of discarded animals, so the paleolithic diet is now confirmed to include botfly maggots. You should add just a sprinkling of maggots to your dinner to get started, so you can get used to them, then later you can eat more. Remember, cavemen didn't have refrigerators, so if you live in a warm area, sorry, you can't refrigerate your meat. Or any food for that matter. You have to put it outside and let it sit out there for a couple days until you eat it all. To replenish electrolytes after a crossfit fitness workout, the paleo diet would include drinking un-treated water. You can't drink bottled water if you're paleo or crossfit. Cavemen didn't have water filters. And no chlorine or sanitation. So you can't drink out of any water fountains or out of the tap water in your house. You'll need to drink out of a puddle if you get thirsty. Or stagnant pond-water will include lots of minerals and other things. Naturally, Loren Cordain of the Paleo Diet says to you that humans are 'designed' exactly for this, and thus you should not expect to get sick from it. Even if there is cryptosporidia or parasites or amoebas and feces in it. Paleo and crossfit says we are evolved for it. If there's any question, there's always the Crossfit Puke bucket, for vomiting up your crossfit recipe meals.